Matt helped me figure out how to set up a loom for what I wanted to do. I had this little branch I liked sitting around for ages. I always intended to craft with it. 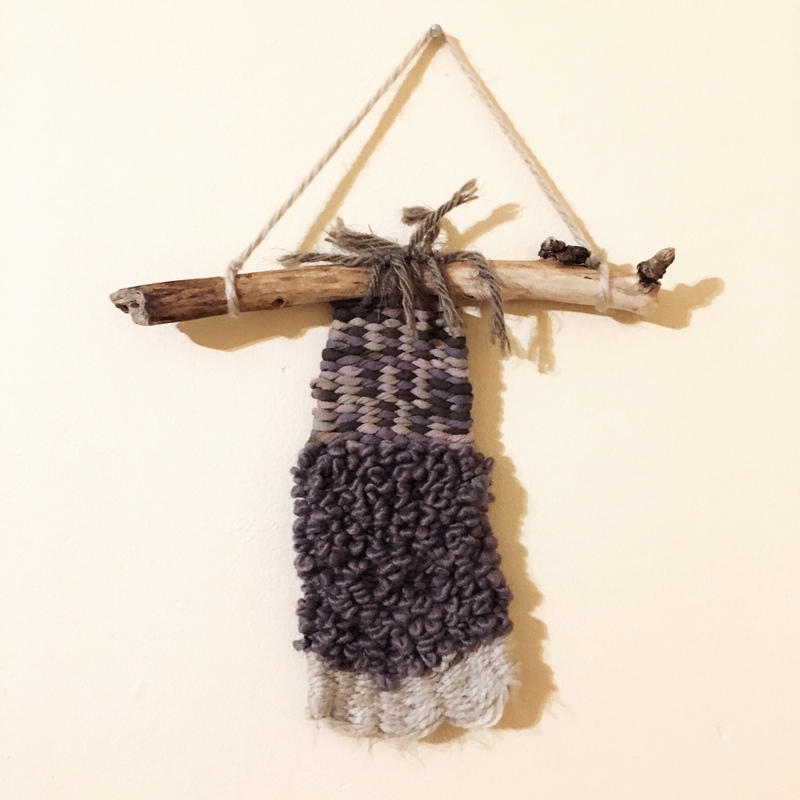 And when Matt got back into weaving when we moved into our house (so much more space than the basement we were living in), I knew I wanted to learn the basics. Besides, how fun is it to learn something new from your partner? To be able to share in something they enjoy? Spoiler: It’s super fun! 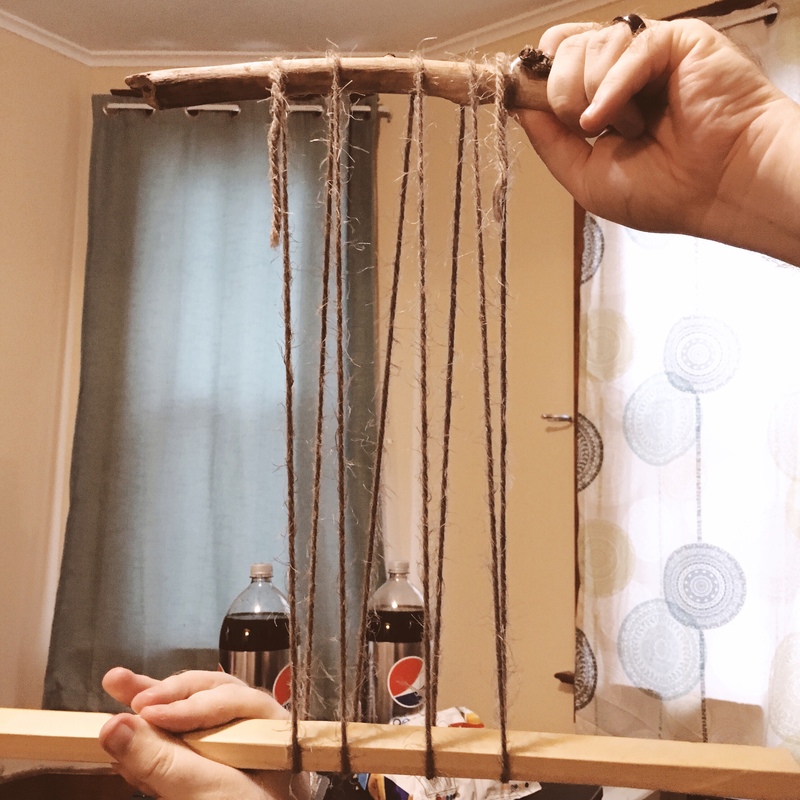 What we did is secure the base yarn (this is the yarn you won’t see once the weave is finished) to the stick and used a piece of Matt’s loom for the bottom, to get it started. You anchor your first bit of yarn to one of the corners. Matt recommends the bottom corners. He finds it easier to pull the weave towards you to block it correctly. Disclaimer: I have no idea if the terminology I’m using is anywhere near correct. You’ll need to pay attention to how you weave. It depends on how many strands your weaving through. 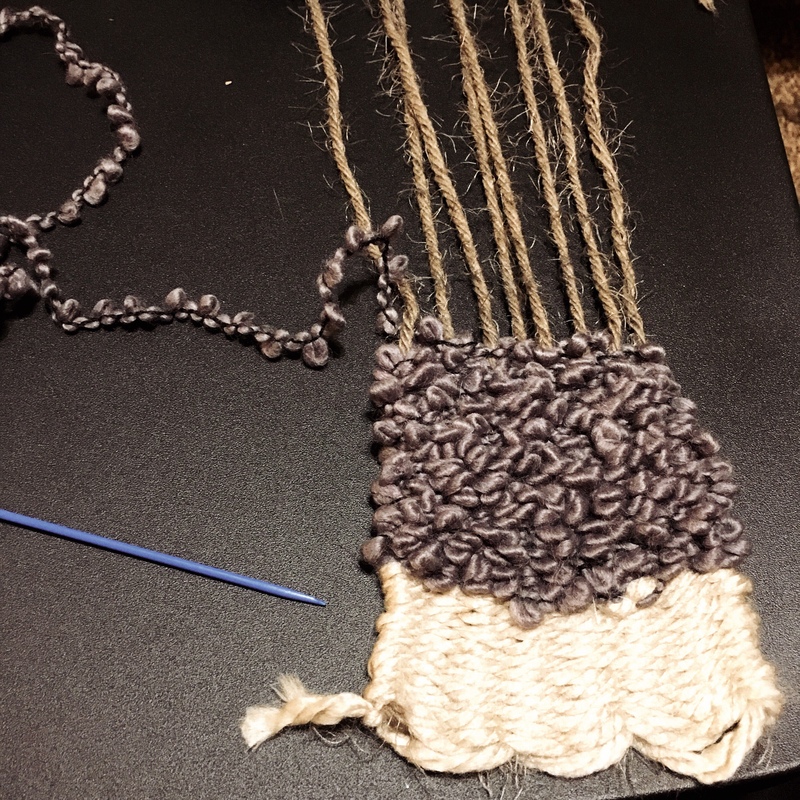 Mine was pretty narrow, so I always started the same way – going over the first strand. This made it easy for me to keep track off. Either direction I was weaving in, I always started going over the first strand. Matt warned me if you don’t pay attention, you could end up undoing the row you just weaved. You just keep going back and forth, over and under, until you’ve reached the end of the long strand you cut. It’s really easy to switch strands, too. Just anchor your strand like you did at the beginning. Matt recommends starting on the opposite side of where you finished when anchoring the new strand. Meaning, if you ended your strand on the left, you should anchor your new strand on the right. 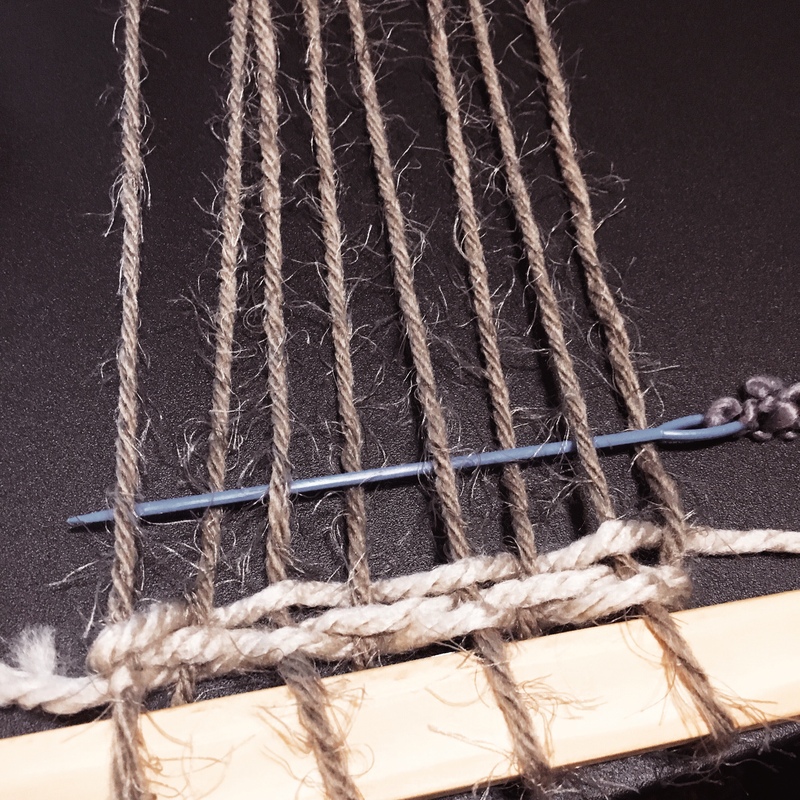 You’ll want to pay extra close attention to how you need to weave your new strand. When I changed strands, I ended up going the opposite way of when I first started. For the second half of my weave, I would go under the first vertical strand. When we got about half-way up the loom, Matt removed the bottom piece of wood and we pulled the weave down. It felt like I’d only been weaving for minutes when he said it was half-way done. I know my piece is relatively small, but it still went by really quickly. I ended up deciding I didn’t want as long of a weave as Matt and I originally planned on. So we cut it short and tied the top off directly to the stick. I took another piece of yarn and made a hanger with it. First, I carved a little divot on the one side so the yarn wouldn’t slide off the branch. Then I hung it on my wall! 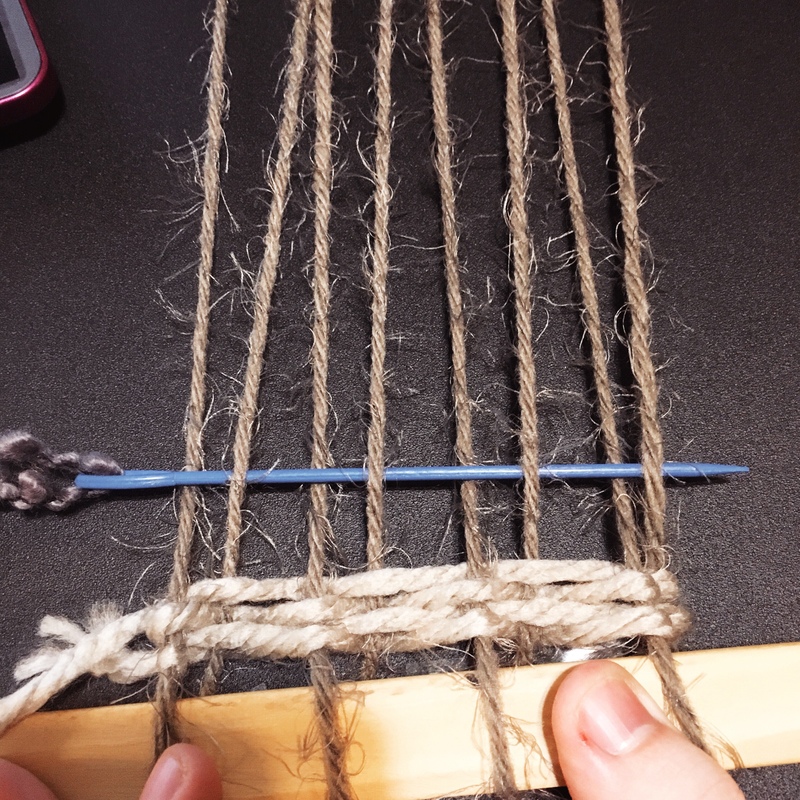 Weaving was way easier than I thought it would be and did not take as long as I thought it would at all. I doubt I have the patience for a large piece, certainly nothing bed-sized, but I can see doing smaller pieces from time to time. Enter your email address to follow me and my cats and receive notifications of any new posts by email.